Home » Bouncy Box » [BOUNCY BOX!] Instant Win an HD Tablet!!! [BOUNCY BOX!] Instant Win an HD Tablet!!! Eligibility: NO PURCHASE NECESSARY. Must be 18+. Every 5,200th eligible entry will win. Starts and Ends: his giveaway started Oct 8, 2018 2:41 PM PDT and ends the earlier of Oct 15, 2018 11:59 PM PDT or when the prize has been awarded. 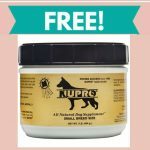 Free Pet Supplement Sample by Mail !